The days get longer and trails grow tired. The ruts cut into the trails, left behind by the assault of numerous riders. 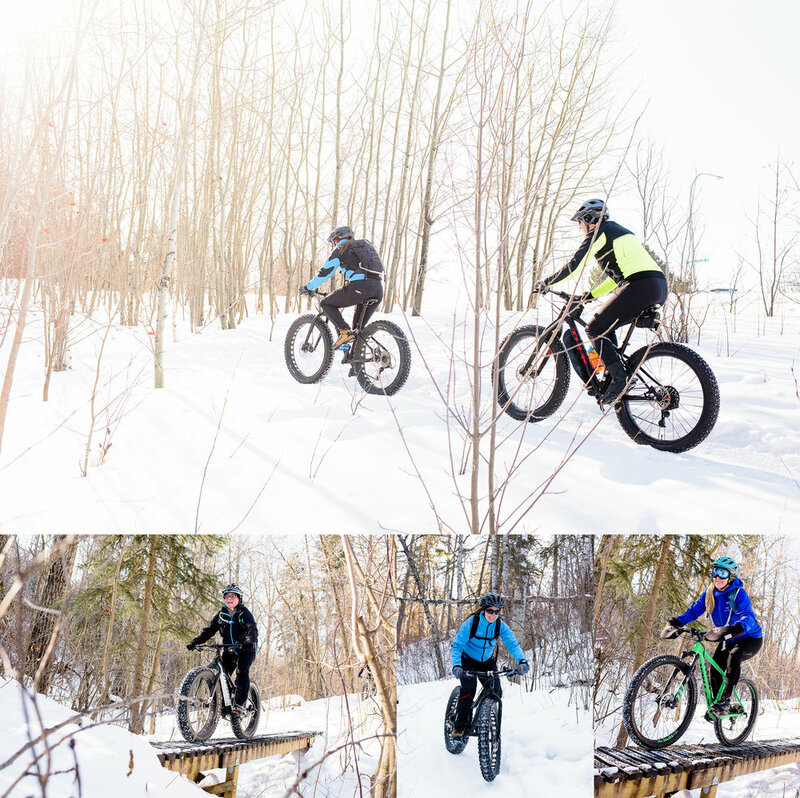 Today I shot photos with the wonderful rider leaders from Women on Wheels, a group dedicated to empowering women in sport through the sport of mountain biking. We are on the cusp of spring, a season that demands patience as we wait for the trails to dry. This is when most of the planning for summer groups starts to build momentum. Though the excitement for summer is palatable, we leave behind a wonderful riding season. Winter riding is a different sport in many ways. 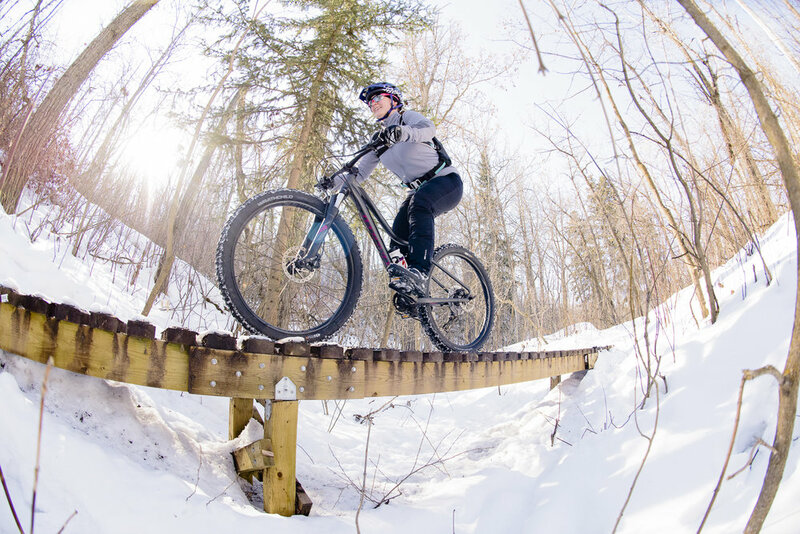 Summer mountain biking just doesn't have the same considerations and by the end of each season, a spark of excitement is felt for the switch. The best part about winter riding is how effortless speed can be. With the snow filling in the gaps between the roots and rocks, the trails are smoother with fewer protuberances; the trails run faster. Strava times are impressive and accomplishments are high. Visibility is better; there are no leaves on the trees, allowing you to preview your path further than summer foliage allows. As the trails wind through the river valley forest, you spot your turn two corners ahead. For a greater challenge, various patches of ice betray the runoff paths from higher ground, making you overly conscious of your choice to brake. Come summer, you will be a faster rider now that you know brakes aren't as necessary as you once thought. In summer you battle the endless barrage of mosquitoes. Although you don't need bug spray in winter, stopping presents a different set of considerations. Clipless petals easily collect snow, making every dismount an exercise in deicing. A habitual exercise of foot banging precedes each attempt to mount your bike. Dressing for the weather takes on an entirely different meaning when biking. Once the exercise of one-on-one negotiations is over and you have convinced yourself to get off the couch, there is a good chance you have overdressed to compensate for your lack of desire to endure the cold. Within five minutes of effort, you are wishing you had left a few layers at home because, let's face it, it isn't really that bad out here. Next time, you say to yourself, be bold and start cold. It takes practice to master the art of winter attire in the world of sport. By the time you've figured it out, it's spring. Group rides take on an entirely different dynamic as well. The lazy, social events of hot summer rides turn into dedicated ride time in winter. With sweat pouring down your back and the cold biting at your face, hands, and toes, cooling down makes the sport less enjoyable. You save the chatting for a pub and post ride beer. There just isn't room for too much chatter and typically extra laps help keep the waiting warm. At the end of your ride, your water bottle is frozen solid and you fold your cold and tired body into the shower to thaw. The wind burn and frostnip outline your smile and tell the story of your journey. It was the greatest ride EVER and you make a mental note for the next time motivation is waining and the couch is warm. In summer you end the ride smiling too, but winter is special. It's when everything matters a little more, each accomplishment is sweetened by the added value of the challenges. Winter riding is the epicenter of type II fun, making you a better, stronger, and more resilient rider. Winter has made me a better rider and I look forward to the change in pace each winter brings.